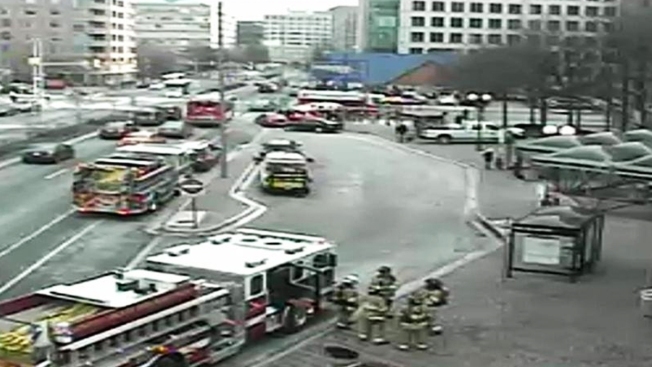 Metro and Arlington County Fire responded to the Ballston Metro station in Arlington after an arcing insulator caused smoke Friday morning. Multiple fire trucks were called to the area. The problem was resolved around 11:30 a.m. The smoke at the station was isolated to a malfunctioning insulator, and was attributed to trash on the tracks. During the response, power was shut off to one track and tunnel fans were turned on, Metro said. There was no fire in the station, Metro said. One track was temporarily shut down, causing 30-minute delays on the Orange and Silver lines while trains single-tracked between Clarendon and Ballston. Metro said at about 11:20 a.m. that normal service had resumed and trains were running at or close to schedule. The incident came just four days after an arcing insulator in a tunnel near the L'Enfant Plaza station filled the tunnel with smoke. A woman inside a train that stopped was overcome by smoke and died. Nearly 70 others were taken to hospitals. An arcing insulator occurs when something comes into contact with the high-voltage third rail, causing the insulator to give off sparks or smoke. A preliminary report is expected on Monday's deadly incident in the next day or so, Mayor Muriel Bowser said Thursday. Stay with NBC4 and NBCWashington.com for more.